Casual food restaurant chain T.G.I. Fridays has become the first national chain to incorporate a mobile payment option called Tabbedout, which will allow diners to open a tab and pay their bill right from their smartphone. The payment option is part of a new mobile app called Fridays that was launched this week. Users will now be able to fire up the Fridays app and enter their credit card as a payment option. After ordering from a server, they can pay their bill using their card on file when they’re ready to leave. The Fridays integration will cover 350 of the chain’s 600 locations, with the remaining restaurants, most of them franchisees, expected to sign on in the future. The Fridays deal is the largest for Austin, TX-based Tabbedout, bringing its total distribution to 800 locations nationwide. For now, users will only be able to pay with their credit cards, though other options will be added later. Tabbedout recently announced a partnership with PayPal (s ebay) which will serve as another payment option for Tabbedout users. Kevin McKeand, VP of sales for Tabbedout, told me the mobile payment integration gives Fridays a way to improve the customer experience inside a restaurant while still giving servers a way to interact with customers. He said Fridays is the first national chain to enable this kind of mobile payment service that gets integrated into a restaurant’s payment system. The deal, McKeand told me, was made possible by the work Tabbedout has done to integrate with seven of the biggest point of sale providers; in this case Micros. Tabbedout’s advantage is that it integrates with a restaurant’s POS system, making it easy for people to pay their bill without having to wait for a server to deliver it to their table. 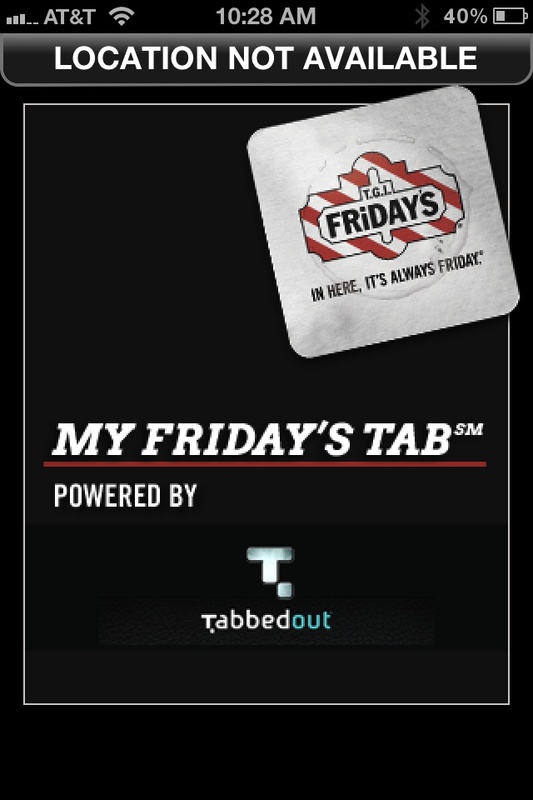 For Fridays, the new Tabbedout integration is part of a bigger effort to build up the chain’s brand. The company previously experimented with QR codes on menus and location-based advertising. The new Friday app will be available on the iPhone(s aapl) initially with Android(s goog) support to come later. How does it work? How does the app know what you ordered? Will this d anything to make the food at TGIF less boring? Ryan, Another great posting! I have tested Tabbedout and have been mostly impressed. There are some material changes that I think will need to take place as the system becomes more widely adopted. With the new relationships from the POS companies I think we will see more rapid adoption of Tabbedout.